A famous legend in martial arts lore tells of Tsukahara Bokuden, a medieval Japanese kenshi. One day while traveling on a commuter boat packed with people, Bokuden was abruptly challenged by another swordfighter who was boasting of his prodigious fighting skill. To avoid engaging in some deadly contest in the presence and proximity of innocent civilians, it was mutually decided that they would set sail to a small island nearby to settle things. Allowing his challenger to alight the shore of the island first, Bokuden, remaining aboard, quickly navigated the vessel away, leaving his unsuspecting antagonist stranded. "This is how we defeat the enemy in my system of fighting!" exclaimed Bokuden. This amusing anecdote (a version of it appears in Bruce Lee's Enter The Dragon), illustates how a potential threat can be thwarted by using some ingenuity. Deception and artifice can still be used even if combat is inevitable. Musashi, in his later years, would feign feebleness and senility in order to draw a younger stalwart into striking range. 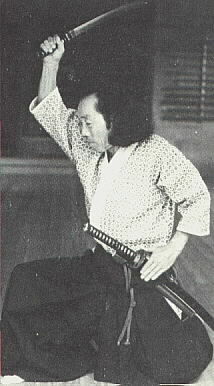 Heiho - strategy, not physical skills, signified the true measure and spirit of the classical warrior. A great book. I've just discovered it. Musashi tells about strategy in that book. A must read, for martial arts and everyday life. I have to read it again. Supposedly it has become fashionable for Japanese entrepreneurs to use "The Book of Five Rings" as a reference guide for executing ruthless business transactions. I guess times have changed since Musashi's days. Real application lies in strategy, not thinking about technique. Thought is a luxury not available in the heat of battle. Right Stephen, we train so ordinary thought doesn't get in our way; always plan ahead. Knowing when to appear defenseless, and when to appear strong is paramount to taking advantage of your opponent. It is such a fluid thing too.. you have to work on the reactions of what is happening in front of you at the time. Isn't that what stategy is all about? Reading the potential of the moment, and taking advantage of it? Yes. Anything can happen in just a moment. Yep... I know that it's been used for that. Yet, it means that the message has been misunderstood. That happens all the time. Still. the message in that book is one of war. How to obtain victory, in all situations. So... I can understand how the message could be interpreted that way. Nevertheless, if one takes the message in there and uses it for his personnal life, great benefits can be attained. Being ruthless is not what's written in there. Enter the Dragon was just on HBO (or Encore... don't recall) a couple nights ago. I meant to TiVo it! I think I've seen it but it was yeeeeears ago. I saw Hero for the first time last night. Very good film! I like sji's comment above. Hero has at least one of the same stars as Crouching Tiger, and it's similar as far as the choreography, but that's all I can recall. Haven't seen Crouching Tiger for awhile. :) There was also a two-hour biography of Bruce Lee on AMC recently; I didn't get to see the whole thing. Very impressive! So sad he died so young. Liked your bottom line "Heiho - strategy, not physical skills, signified the true measure and spirit of the classical warrior." Just wish people would learn that it can be applied not only in fighting, but in everyday conflicts too. At least that's what I've decided to try to teach. Welcome to my site, dS. As you probably know, your idea to apply classical fighting strategy in daily life is not new, although it's rarely practiced that way (at least as I see it). One of the finer features of the martial arts are their ability to transcend the training hall into all aspects of living. Thanks for stopping by. I bet people did - "nothing is new under the Sun" :). Though if you can refer me to a good site or a book - would be grateful. Sure, no problem. The classical book of strategy is The Book of Five Rings by Miyamoto Musashi. Musashi was a Japanese sword fighter who lived during the seventeenth century. I got the story about Bokuden from Donn Draeger's Classical Budo (Weatherhill, p.71-2). I wouldn't mind at all. And thank you. but I hoped you can point to the source of application in daily life. Thanks anyway - and great blog!